1. In a mixing bowl combine the flour and sugar. Separately in a jug beat together the egg and milk until combined. While whisking, slowly pour the egg and milk mixture into the flour, mix well to ensure you have a smooth batter. the pancakes warm while you cook the second batch. 3. 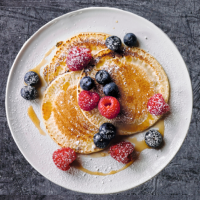 Serve 3 pancakes on a plate and scatter with the raspberries and blueberries, drizzle over the maple syrup and dust with the icing sugar.